Feeling thankful that we are not among the passengers who had to wake up at 2:00, 3:00, or 4:00 am to go to the airport, we wake up and have a lazy coffee on our balcony before finishing our packing and getting our suitcases into the hall before 8:00 am. That is the time we must also vacate our room, so we hied to breakfast with our hand luggage in tow. We have until 9:30 when our taxi will come to take us across the river. 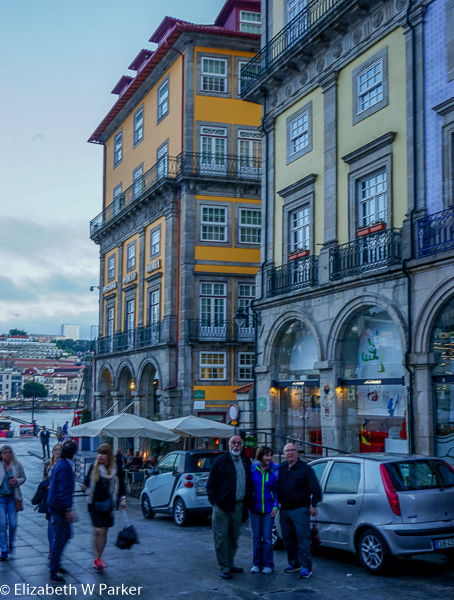 Cindy, Greg, Gerry and I are staying in Porto for two additional nights. 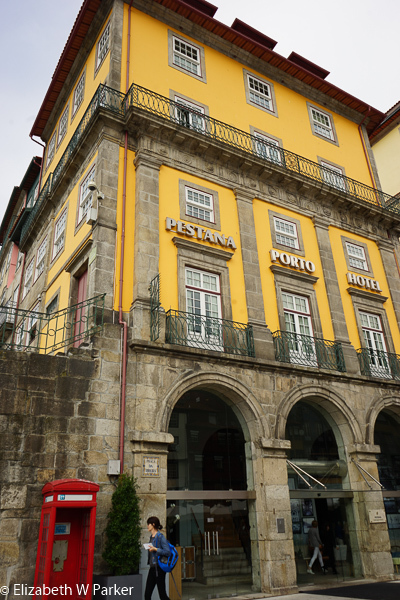 We chose a hotel that Gerry and I saw seven years ago when we were in Porto. 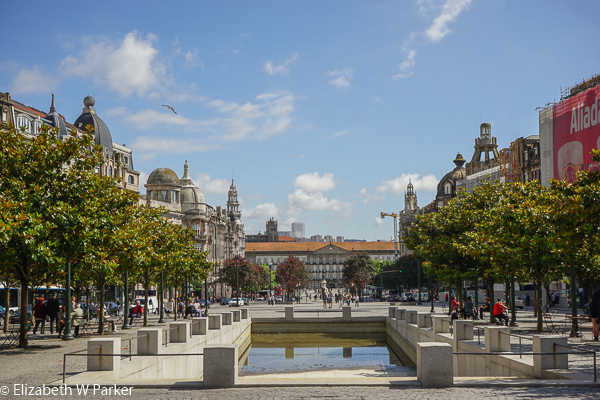 The location is just perfect: On Ribeira Square and the water! It has since changed names, but I found it using the location and Hotels.com, and it will be our base for the next two nights. The hotel is called the Pestana Vintage. Pestana is a chain of luxury hotels, though I would not say this is luxurious, except for maybe the price… The hotel has a vintage travel theme though that gets me thinking about pictures of my grandparents traveling…The lobby has many small rooms were guests can relax and get service from the small bar across from reception. The service at the bar isn’t anything to brag about about…really, just the opposite. The reception staff, however, is very helpful and nice. Our room is nice, too. I cannot tell you what floor it is on, as the hotel’s floor numbering seems particularly challenged, but we press # 2 on the elevator and that gets us there. (“Two” is of no help when trying to pinpoint our windows from the outside!) We have two balconied windows looking out at the water. (We would have to call the front desk for a key to open them though, which means we have the view, but not the fresh air or romance of a real open window.) The room is small; the bed is one of the nicest we have had this trip, but my side slants toward the floor. We probably would not stay here again, unless it were for the location. We cannot check in at 10:00 am but we can leave the luggage and go out exploring. First item of business, is to locate the Chez Lapin restaurant where we had fantastic octopus 7 years ago. It is still in business! Yeah! My mouth is watering already. As I had a plan, and no one else had a preference, I dragged the group up to see the “J.K. 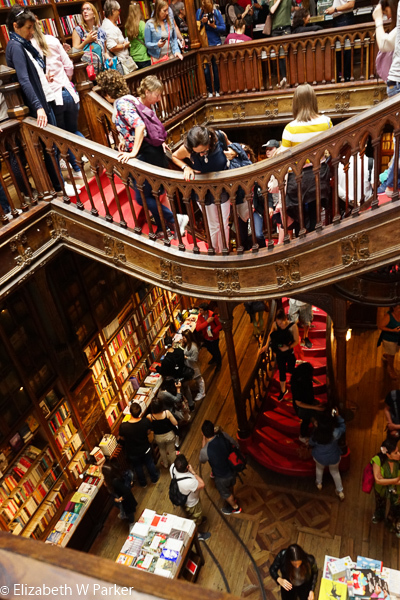 Rowling Bookstore” (Livraría Lello & Irmão). No, that is not the name. But neither is the name, the name, so that name is descriptive enough that anyone will know where you want to go. 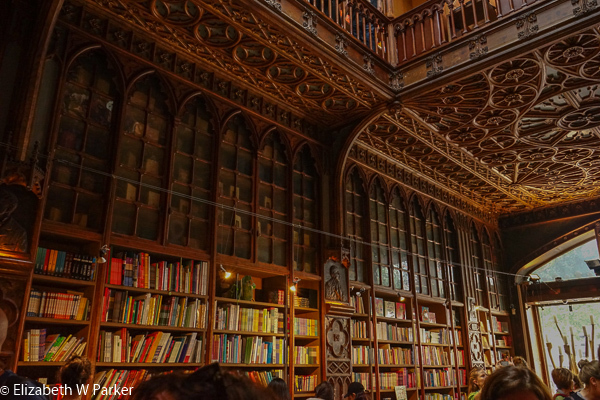 It is really the bookstore where J.K. Rowling, who was living in Porto and teaching English, got her inspiration to write the Harry Potter books. So, it was a sort of pilgrimage. Gerry poo-pooed the concept and went to sit in a café, but Cindy and Greg and I bought our tickets (4 euros each) and stood in line. I am running out of really good adjectives to describe all the things I like, but the only one to fit this place is “fantastic.” Take it to mean “like fantasy” or take it to mean “really, really cool” and you’ll be right with either interpretation. I am going to use it like fantasy – in fact they could have filmed Harry Potter here! It would have made a perfect place for the wand shop – if it weren’t already filled with books! Right in the center is this organic staircase that winds up and around like a huge vine to transport you to the second floor. The ceilings are carved wood, as are the book shelves. The place is dark, lit from the top by a huge stained-glass window above the second floor. It was crowded, and that is the only bad thing I can say about it. Don’t go there to shop for a book, though if you get one, you can use your entrance fee to discount the price. Go with the attitude that it is a tourist trap and you won’t be disappointed. It only costs 4 euros, and I can guarantee, you’ve probably never seen anything like it! Even Gerry was disappointed he had decided not to see it. 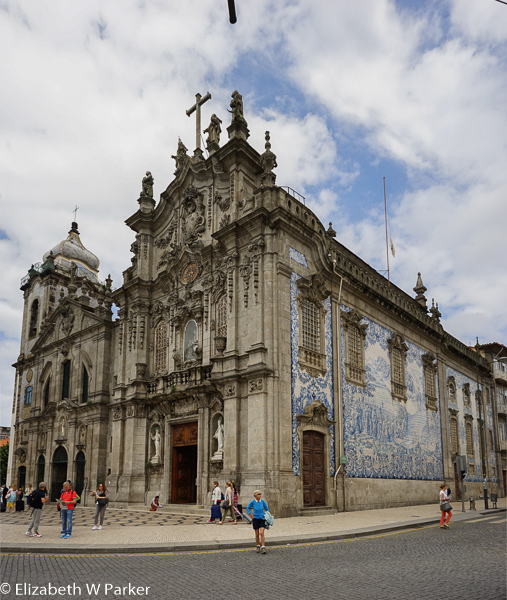 While we were in the neighborhood, I had to go over to see the Carmelite and Carmo churches to satisfy a curiosity I had. 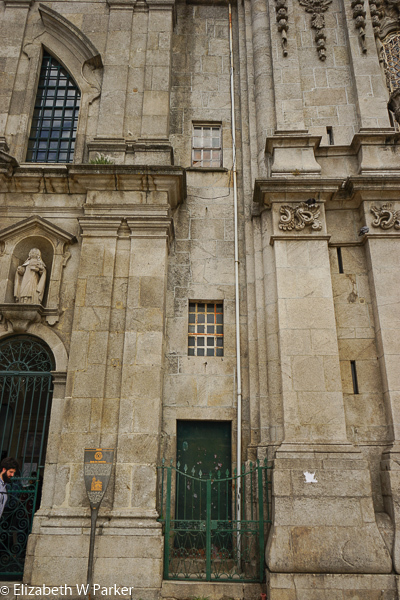 My guide book told this dubious story about the convent (the Carmelites) and the monastery (The Carmo) not being allowed to share a wall – They had to keep those randy nuns and monks from lusting for each other through the stone – so there was a house “the width of a letter box” built between them that was “inhabited until 1980.” I needed to see that. But I didn’t find it. All I found was a doorway that looked like it had always been part of the convent. Maybe a close look at the pictures I took will reveal something more. From here we walked back down the hill to the Ribeira and found a table on the quay outside where we finally satisfied the 7-year-itch to retry the roasted octopus. It was just as good as we remembered! Don’t you just love it when that happens! Roasted octopus and potatoes in olive oil is no light lunch…as if we need an excuse to take yet another proprandial snooze! venture out. We are headed to a vegetarian/vegan restaurant that both the hotel recommended and so does Google. 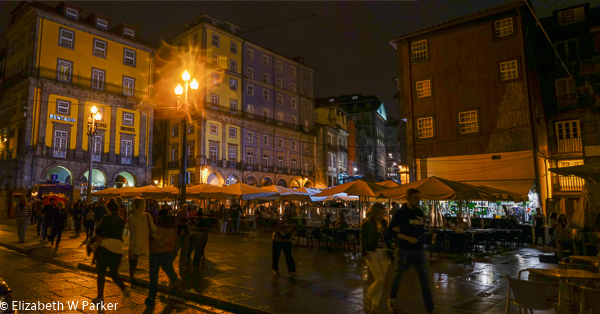 We were already walking on the Rua das Flores, looking in all the shops when it started to rain again. We beelined for the restaurant and had a delicious and cheap dinner (9,90 euros) – an all-you-can-eat buffet of all vegan dishes (salads, appetizers, mains and desserts) that had variety and was very fresh. Called Da Terra, I can recommend it without “reservations” (which you also do not need!). On the way back to the hotel, we did some shopping; at least the tourist stores were still open. Back at the hotel, we had a nightcap at the hotel bar. 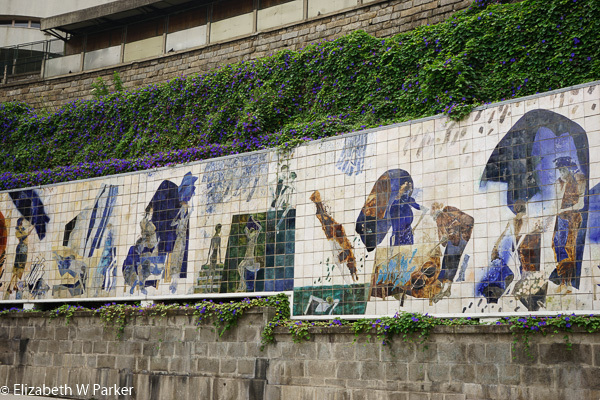 Azulejos work is not a forgotten or out-dated art form! I awoke to a pink sky, and true to the old adage, we had rain by 10 am when we ventured out for a tourist walk. Fortunately, our destinations on this morning were both close and we were promised sunshine by noon! Perhaps, if you’re not that keen on the Baroque period, you will find this exceptionally gaudy, but it is a prime example of how a Baroque interior will look when it has not been remodeled in subsequent periods. It is outrageous! 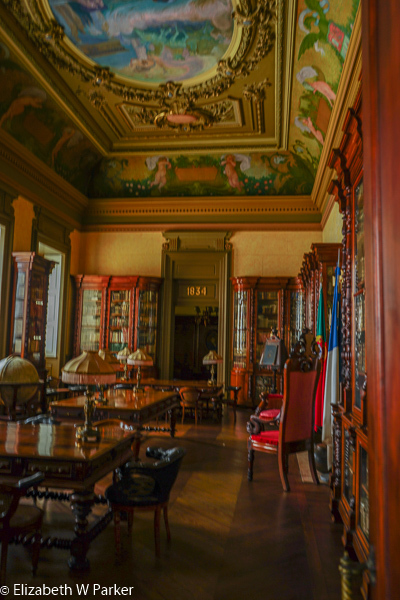 The building is no longer consecrated – it is now a museum, so you can really move around and get an intimate feel for the space and even imagine the building in its heyday. With a good guide, you will walk away knowing and appreciating much more! Our next stop was literally right around the corner, but once inside we were told that the building was closed until Saturday…no further explanation offered. 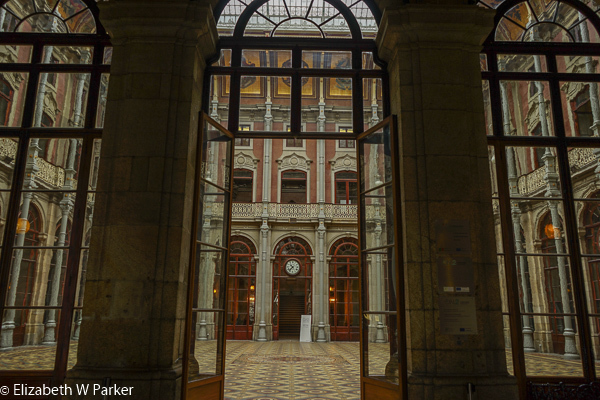 This was at the Palácio La Bolsa, famed building said to be “unbelievably beautiful.” It is only accessible through a guided tour, so be sure to look it up ahead of time and plan accordingly if you want to see it. It is on my list for the next trip. Unfortunately, the Bolsa being closed, left us a bit at odds to fill up the rest of our morning. There was something quite close by, called the Mercado…but that was not at all a “mercado” but a venue for shows and it was closed at this hour of the morning, too. We are waiting for a phone call from the concierge of our hotel, to confirm if we have reservations to eat at a restaurant called DOP. But being the take-charge sort of people we are, we decided to walk that way and just inquire in person. It is not far from here and on the way to the train station so we swing by. Oh-oh! Closed on Mondays for lunch. That answers that question. 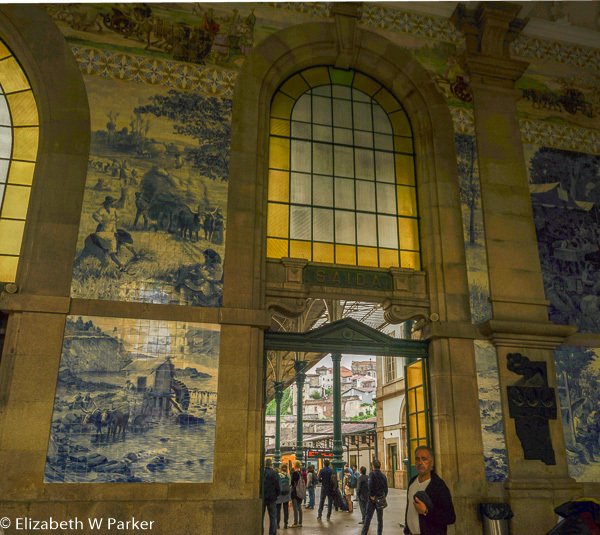 The station is just a hop, skip and a jump from the cathedral, Sé do Porto, so we headed there next. 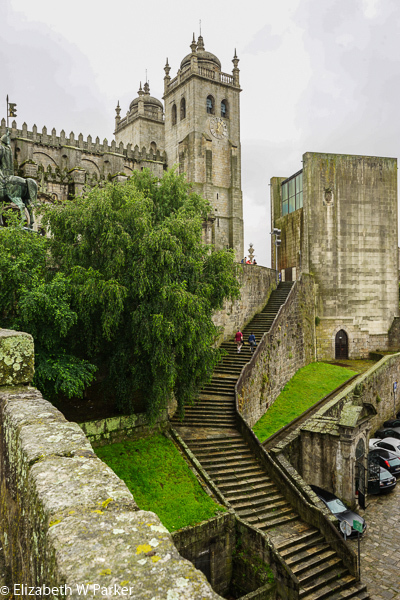 I find it hard to break myself of the habit of visiting the cathedral in every major town – it just seems like the proper thing to do and, preferably, the first. (Like paying one’s respects?) But after the amazing San Francisco Church this morning, the interior of the cathedral looked old and worn, tired and dull. We didn’t stay for long. The weather was beginning to improve, but we were still dragging our feet. Gerry led us through the maze of streets below the cathedral, a similar walk to the one we took with our guide the weekend before. Step by step the weather improved, and so did our moods. We decided, though we have not heard a word about lunch, to go back to the vegan/vegetarian place where we ate dinner last night (Da Terra). We all liked the food, and there was nothing that none of us wouldn’t eat. Perfect! It was and we had a second excellent meal. And, of course, a good meal deserves a good nap. Neither Gerry not I could sleep that afternoon so we left the hotel early to walk back up to the area near the Praça de la Liberdade. We had skipped it in the morning because of the rain, but now the sun is shining. 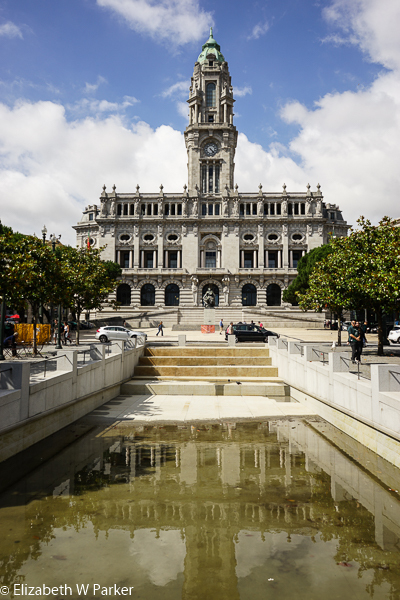 The Praça is at the base of a long, monumental way, the Praça do Municipio, bordered on one side by the Avenida dos Aliados, an homage to the Allies with who Portugal fought in the First World War (remember, Portugal was neutral in WWII). At the other end of this promenade is the city hall, a grandiose building, humbled only by its rather quotidian use. Grand buildings, trees, shops and cafés line the outer edges. 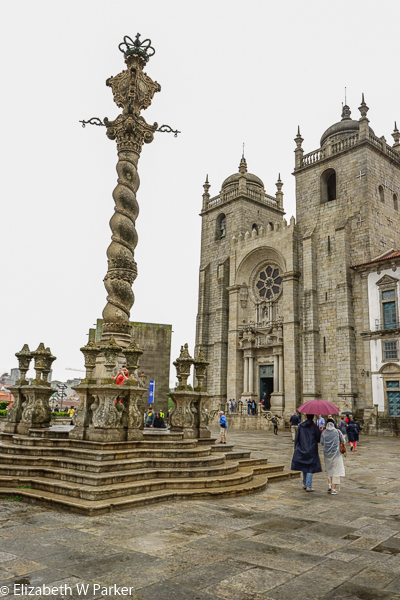 The Praça is close to the train station and the cathedral, so from here we decide to walk past both of them to the upper deck of the Dom Luís I Bridge – access is easy from here. We tried to contact Cindy and Greg to let them know where we are and so we can meet them, but they must still have been sleeping. We walked across the bridge and then took the funicular from the top down to the cais (the quay), where all the port houses are, to explore this area of Gaia. Our ship is still in port, reminding us of where we were and what we were doing just a week ago! 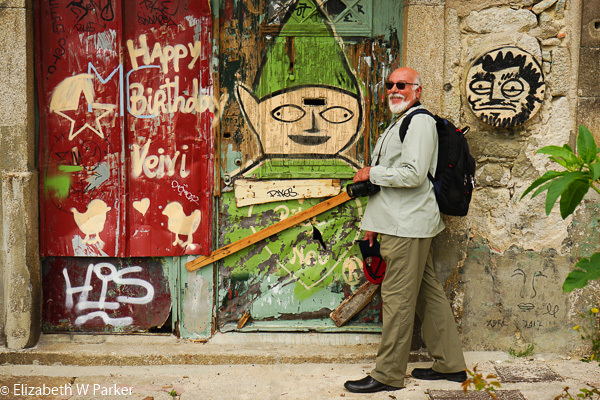 We wander around the port lodges, getting off the main drag and poking around the narrow alleys and streets behind. There are lots of places to taste – each house trying to lure you in with a different experience or a different angle. It’s fun! We have been tasting wine from the region all week though, so we do not indulge. 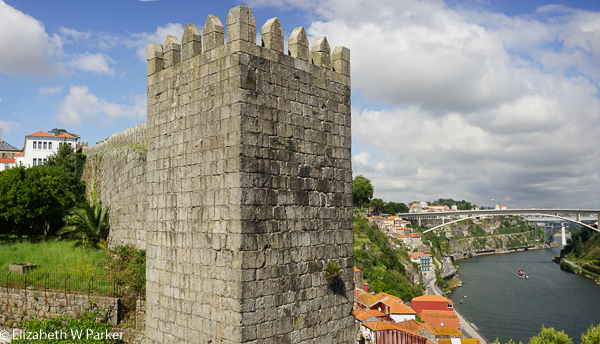 We did decide that a trip over here, for an evening of tapas and wine, would be just as good as sticking to the Ribeira side of the river. Add it to the list for the next trip! 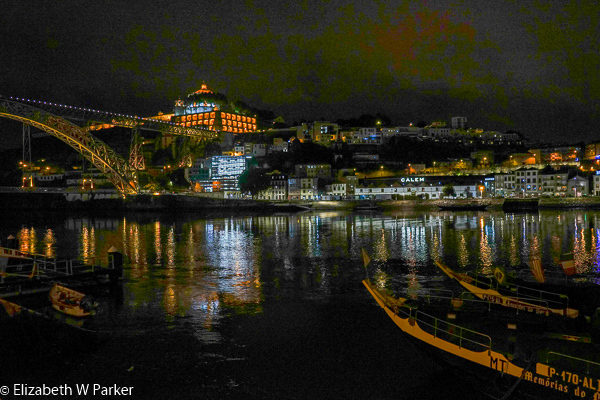 We crossed back to Porto and the Ribeira district on the lower level of the bridge, and met up with Cindy and Greg for dinner. We chose a place at the suggestion of the hotel…a place that is right around the corner (how often do I say that?). Called the Postigo de Carvão, we were quite happy. Our waiters were nice, and friendly, the food was very good and so was the wine, but unfortunately it seems they also cater to tour groups. Having been just recently a part of such a group, we were not overly thrilled with these dinner companions. They were noisy, but otherwise, unobtrusive, and we enjoyed ourselves all the same. After dinner, we lingered in the square talking over a bottle of wine, just like hundreds of other people! This morning is our last in Porto. I am not yet feeling excited to go home, so there is some sadness in saying goodbye to Porto. This was our second visit to the city, and we remain as enchanted by all its beauty and foibles. I will look forward to coming back. The main reason is not that we have missed many things that there are to see here…probably we have hit more than the mere highlights. But truly this is a city to just “be” in; to walk the streets, to look at the people, to watch the sun rise and set, to taste the fresh fish in its restaurants, to savor the smiles of the people who live here. 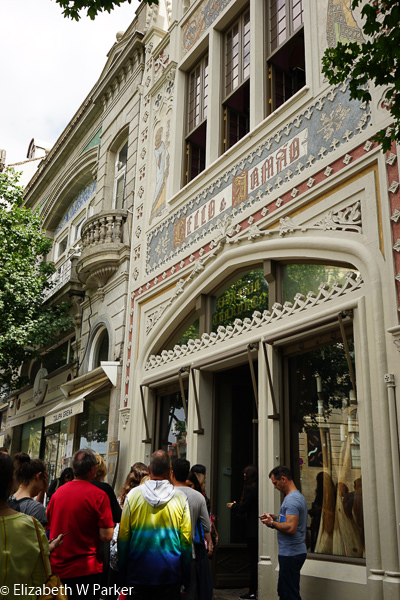 The streets are filled with interesting shops and the squares with funky cafés. There is always the promise of the Douro River – especially now that we know what surprises are along its banks and high on its hills. This has been a particularly good trip. We have had engaging, fun and interesting traveling companions throughout. New friends we made on the cruise we hope will become life-long friends, and with our friends Cindy and Greg we are already talking about future destinations. Yes, it is a nostalgic good-bye. 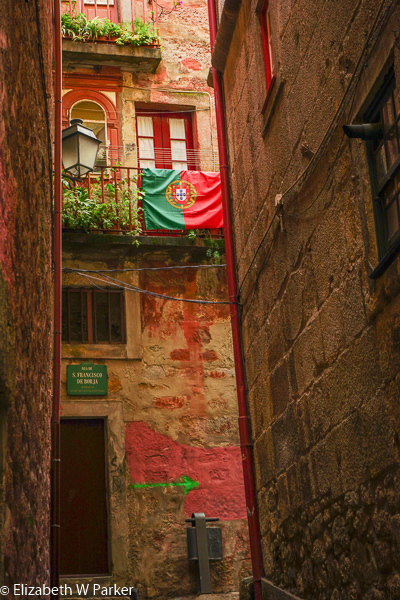 From here, we spent one last day in Lisbon on this trip itinerary. Click here if you are following that journal. Click here to return to a list of all the Portugal posts.